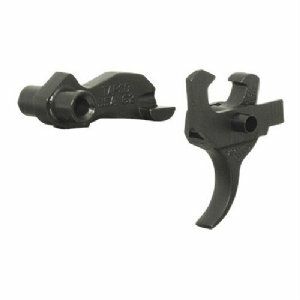 The Tapco INTRAFUSE AK G2 Trigger Group offers an improved trigger pull of 3-4 pounds and eliminates the painful trigger slap common with other designs. Tapco created a "no fumble" trigger sleeve which allows you to assemble the trigger group outside of your rifle and then drop it in as one piece. All G2 components are heat treated, manufactured out of 4140 tool-grade carbon steel, and finished in dark black oxide. Upgrading your trigger assembly to the INTRAFUSE AK G2 Trigger Group, simply put, is the best decision you can make to bring out all the power your AK-47 has to offer. To top it off, the G2 counts as 3 U.S. 922r compliant parts. *Note: INTRAFUSE G2 Trigger Groups are not compatible with the Saiga platform. INTRAFUSE G2 Trigger Groups are also not compatible with NoDak Spud NDS-3 and NDS-65 "economy" receivers. In some cases, the use of these two products together can create accidental double firing of the weapon.